“Til death do we part.” Well, okay, about 50% of the country’s couples part before death, but your intention when you marry is that the relationship will last forever. Traditionally, gold and platinum have demonstrated the strength of the relationship and the depths of love. On the other hand, from a symbolic standpoint, you can make a statement about the strength of your relationship by purchasing a wedding ring made of a very strong substance. Men’s titanium rings and women’s titanium rings offer beautiful, simple appearances and outstanding strength. Titanium has the highest tensile strength to density ratio of any metal. This means that your ring is very light, yet cannot be deformed by pulling or stretching. In addition, it resists scratching better than gold. These characteristics make it an ideal representation for the institution of marriage. 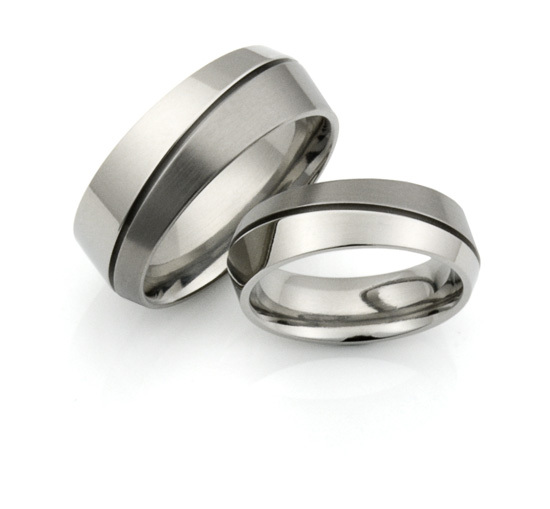 Like a good marriage, men’s titanium rings do not feel burdensome, yet they will endure through all kinds of stresses. Women’s titanium rings, like a good marriage, will not tarnish over time nor will they cause physical irritations. These rings can be created with a very simple look, for those whose marriage is based on very simple principles, or they can be embellished with gold and precious stones, for those whose relationship is more complex. Previous generations of husbands and wives opted for more traditional wedding jewelry. Gold, diamonds, platinum and silver in a variety of settings have been the choice for Boomers and Gen X couples. Younger couples find the simplicity and cutting-edge characteristics of titanium to be their choice for demonstrating their marital commitments. That said, men’s titanium rings can be “dressed up” so that they stand out. A hammered finish brings texture to your ring. A gold inlay offers a classy, visual appeal. You can buy women’s titanium rings with diamond or other jewel insets so that your ring harkens to a more traditional piece of wedding jewelry. You can also get a sandblasted finish or sandblasted grooves on your ring. Sandblasting offers an alternative that is less harsh than the hammered finish, but not perfectly smooth like more typical rings. We understand that your marriage is unique and you may want a custom-made ring that symbolizes your special union. Let us know what you want. You can see on our website that we have catered to a number of unique requests. We would be delighted to work with you.